TransAsia Shipping Lines serves the Cebu - Surigao route daily except Monday. WG & A Shipping Lines serve the Manila - Nasipit - Surigao route every Tuesday and Sunday. Millennium I an Maharlika 5 ferries the Lilo - an - Sur route Daily. Buses from Pasay City have trips going to Surigao weekly. Daily trips from any point in Mindanao going to Surigao are also available at regular schedule daily. Surigao City is the jump - off point for Surigao Island, which can be reached through inter - island fast crafts bound for Dapa town. Jeepneys ply the Dapa - General Luna route. The province has access to the world via airmail, cargo firms, direct telephone/cellular lines, SMART, GLOBE as well as Mobiline and the world wide web. Communication establishment are ready to be of service to our guest and visitors. 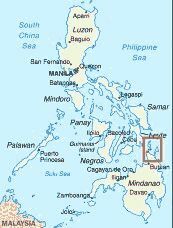 The country's telephone code is (63) and Surigao del Norte's code is 8400. For further contact write and call to the Provincial Governor's Office Capitol Site, Surigao City, tel. No. (086) 826 - 0462 and 232 - 7909 with fax no. (086) 826 - 4259, email address: ppdo_sdn@philippines.com.ph or contact the Provincial Tourism Office at tel No. (086) 231 - 9271.